Merle Wood & Associates is proud to announce that the NITA K yacht sold today, in an in-house deal. Accommodating 10 guests in 5 staterooms, the Delta 124’ tri-deck series yacht features a large on deck master suite, plus 3 double queen staterooms (2 with Pullmans), and 1 twin, which are all well-appointed and located on the lower deck. Each features its own en suite and entertainment system. Having the NITA K yacht sold represents yet another Delta yacht that Merle Wood & Associates has represented. Over the years no other yacht brokerage firm has sold more Delta yachts than we have, whether representing the seller or buyer (including new yacht construction). Delivered to her original owners in 2003, the NITA K yacht sold with an interior that was refit in 2014. Her modern interior was styled by yacht designers at Delta Marine, who chose cherry wood to create a warm atmosphere. The full bar in the main salon is accompanied by a large sectional with armchairs that complement the color of the sofa’s throw pillows. Large windows bring the outside in and continue forward in the formal dining area. Almost completely open, with the exception of a storage buffet, the formal dining table is surrounded by plush damask chairs. A staircase here leads up to the skylounge or down to the lower deck. The NITA K yacht sold today, offering her new owners various outdoor deck spaces for relaxation, dining, and entertaining. The main aft deck features a large table and chairs under a hardtop for al fresco meals prepared by the yacht chef, while the bridge deck features a more casual al fresco dining option, also covered by a hardtop to offer shade while dining. Equipped with 2 Caterpillar 3412 engines, she has a maximum speed of 15 knots, a cruising speed of 12 knots, and a range of 2,500 nautical miles at 10 knots. She is fitted with Quantum zero-speed stabilizers for the ultimate in comfort. 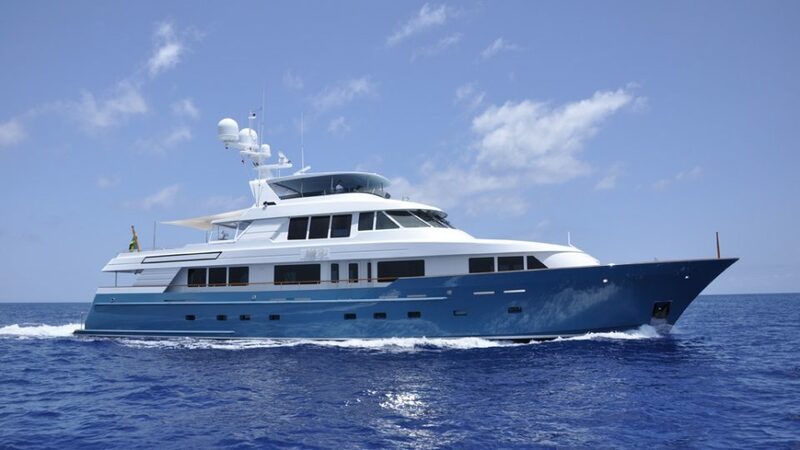 Many thanks to the corresponding brokers who assisted in the marketing of this vessel, and congratulations to luxury yacht brokers John Cohen and John Jacobi on the sale. For more information on motor yachts for sale that are similar to NITA K, please contact Merle Wood & Associates. For additional information, read the full NITA K yacht specs or view the NITA K yacht price and details. For information about the NITA K yacht, or for expert knowledge from a qualified yacht charter broker, simply contact the luxury yacht brokerage firm of Merle Wood & Associates for assistance.